JUST A COINCIDENCE? The general area where a brush fire was reported before dawn Sunday off Siesta Public Beach showed no apparent damage just a couple of days later. Photo by Rachel Hackney SARASOTA AUDUBON VOLUNTEERS REPORT VANDALISM AT A BUFFER FOR BEACH-NESTING BIRDS ON SIESTA KEY JUST DAYS BEFORE A FIRE ERUPTS NEARBY By Rachel Brown Hackney Editor Sarasota Audubon volunteers are wondering whether it is more than just a coincidence that stakes and plastic tape were removed from a known nesting area for endangered birds on Siesta Key and a fire erupted in the same general area three days later. volunteer discovered the damage on the 29th when he was making his rounds on the beach, searching for any signs of nests. 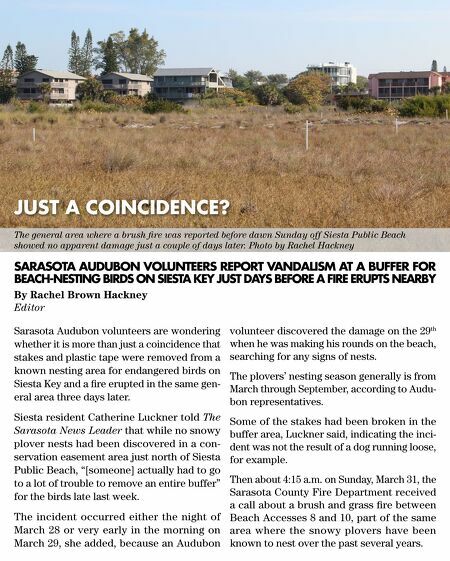 Siesta resident Catherine Luckner told The Sarasota News Leader that while no snowy plover nests had been discovered in a conservation easement area just north of Siesta Public Beach, "[someone] actually had to go to a lot of trouble to remove an entire buffer" for the birds late last week. Some of the stakes had been broken in the buffer area, Luckner said, indicating the incident was not the result of a dog running loose, for example. The plovers' nesting season generally is from March through September, according to Audubon representatives. Then about 4:15 a.m. on Sunday, March 31, the Sarasota County Fire Department received a call about a brush and grass fire between The incident occurred either the night of Beach Accesses 8 and 10, part of the same March 28 or very early in the morning on area where the snowy plovers have been March 29, she added, because an Audubon known to nest over the past several years.